Kenya, part of the East Africa region, is a country which excels at capturing the true essence of what an African safari is all about. Especially for those new to the rather addictive realm of the safari, the feeling of setting eyes on utterly wild animals in Africa for the first time can be a surprisingly powerful sensation for the mind and soul. The vast plains of Kenya offer a unique and unforgettable glimpse into the remarkable world of the animal kingdom, impossible to comprehend until you are there in the flesh! Tourism is Kenya’s dominant industry, so travellers are spoiled for choice when it comes to exciting safari destinations. There is a Kenyan safari to suit everyone so browse our selection of recommended Kenya tours and safaris below, or let us know your specific interests and we will tailor-make a Kenya safari exclusively for you and your group. The extraordinary Masai Mara is one of the legendary wilderness wedges of Africa that attracts a phenomenal number of nature and photography enthusiasts to its great plains. The Mara, world renowned for the captivating sight of the annual Great Migration, is a natural extension of Tanzania’s Serengeti region. Lake Nakuru National Park offers brilliant birding and is one of Kenya’s best safari destinations. When the lake is shallow, warm and alkaline, the swathe of pink flamingoes that comes to feed on blue-green algae is a wondrous sight. Nearby Abedare National Park is known for its spectacular waterfalls and the vibrantly patterned mountain bongo, a critically endangered forest antelope only found in the wild in the Abedare Mountains. Breathtaking Mount Kenya National Park showcases the second highest peak in Africa, complete with glaciers despite its equatorial location. Amboseli National Park offers a classic African safari setting…huge herds of elephant and other plains game meandering across vast plains dotted with flat-topped acacias with snow capped Mount Kilimanjaro making a striking backdrop! East of Amboseli, Tsavo National Park encompasses a massive 22,000km2 and is indeed Kenya’s largest national park. Its close proximity to the Kenya coastline and the exotic, tropical city of Mombasa provides opportunity for a fabulous safari and beach holiday combination! 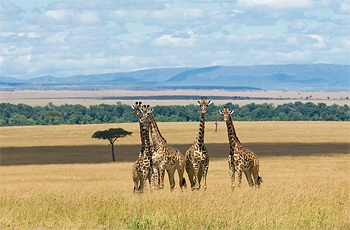 This 5 Day Kenya safari is ideal for business travelers looking for a Masai Mara experience, coupled with Nairobi. 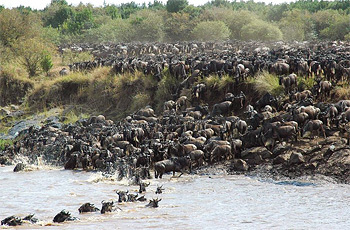 Say hello to Kenya in this 4 day safari that starts and ends in Nairobi.